The home and office space of Belgian design duo Sculp(IT) is not only functional and beautiful – it’s environmentally sound and structurally fascinating. The structure sits on an extremely narrow piece of land (under 8 feet wide) so the building is essentially turned on its side. 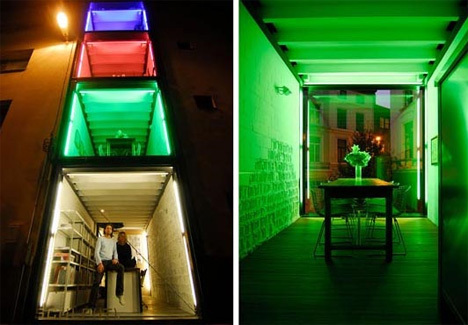 Each level is made of a separate shipping container, and each container has its purpose: work, dining, relaxing and sleeping. The rooftop deck adds an important outdoor element to the design.